During last week’s snowstorm, Eric and I were tucked safely inside our apartment with a full Netflix queue and plenty of snacks and comfort food to keep us snug, including big bowls of warm chili. I’m always testing out different chili recipes, and I love this version because it comes together so quickly. The roasted beets also give a nice texture and unexpected flavor dimension. Preheat oven to 400°F. Peel beets, halve, and slice as thinly as possible. Mince garlic. Drain black beans and kidney beans, then rinse both. Quarter lime. Pat beef dry with paper towel. While cornbread bakes, heat 1 tablespoon olive oil in a medium pot over medium heat. When oil is shimmering, add spice mix, garlic, beef, and ½ teaspoon kosher salt and cook, breaking up with the back of a spoon, until meat loses its color, 3-4 minutes. Stir in crushed tomatoes. Increase heat to high and bring to a boil, then reduce heat to medium and simmer until thickened, 3-4 minutes. oven, and bake until crisp, about 15 minutes. Stir in black beans and kidney beans. Cover pot and cook until chili is thickened and flavors are melded, about 5 minutes more. Remove pot from heat. Taste and add salt and pepper as needed. 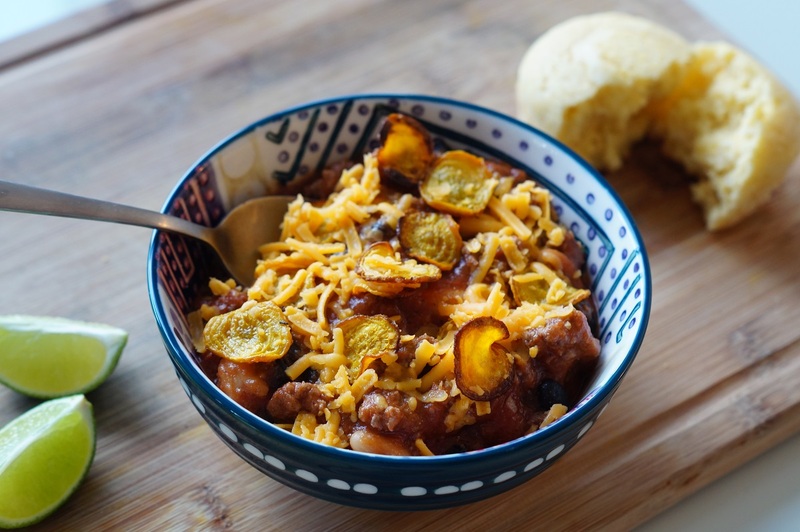 Garnish chili with all the things: Cheddar, beet chips, and lime wedges. Bring ginger to a boil in a medium sauce pan. Remove from heat and add lemon juice, honey, and cayenne pepper. Let the mixture steep for 15 minutes. 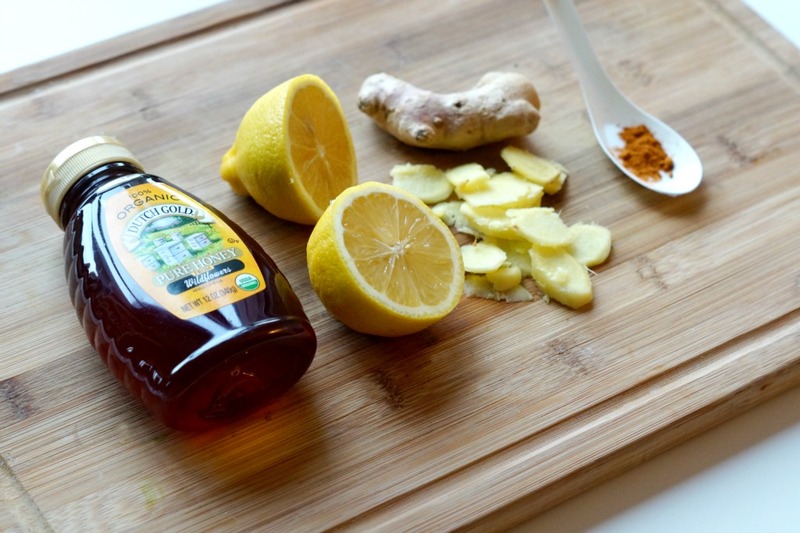 Afterwards, just strain the ginger, sip, and be well… hopefully! Since my husband refuses to eat fish (or any other seafood, except shrimp) this is technically a recipe for one (plus leftovers!). In any case, if you’re a fan of salmon and fresh citrusy flavors, then you’re going to LOVE this recipe. It’s perfectly filling, without being too heavy. Enjoy! In a small bowl, stir together juice of 1 blood orange, Worcestershire sauce, and soy sauce to make glaze. Set aside. Add gnocchi and a generous pinch salt to pot of boiling water. Cook until tender and floating to the surface, 3-5 minutes. Drain and set aside. While gnocchi cooks, heat 1 tablespoon olive oil in a large pan over medium-high heat. When oil is shimmering, add garlic, kale, and 2 tablespoons water and cook until bright green, 2-3 minutes. Transfer to a plate and set aside. Rinse salmon and pat dry with paper towel. Heat 1 tablespoon canola oil in a separate large pan over medium-high heat. Season salmon with salt and pepper. When oil is shimmering, add salmon skin-side up and sear until browned, about 3 minutes. Flip salmon and immediately pour over blood orange glaze. Cook, basting occasionally, until salmon is opaque and cooked through and glaze is sticky, about 2 minutes more. 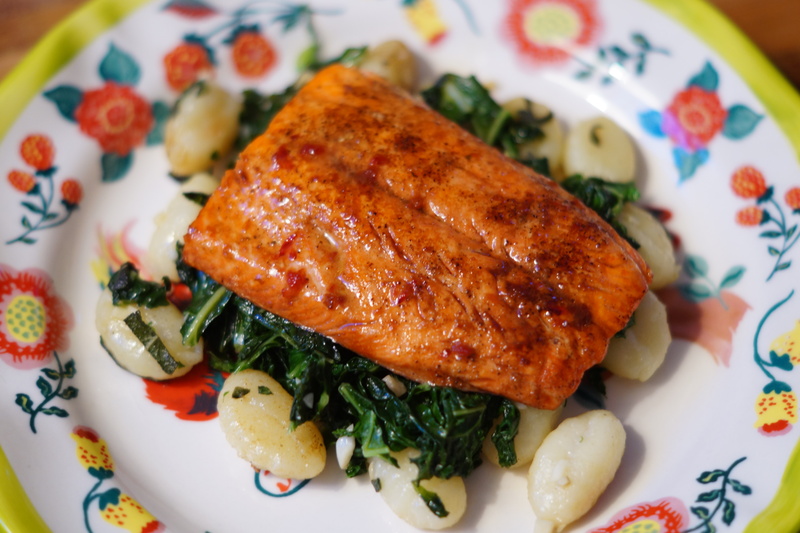 While salmon cooks, heat butter and sage in pan from kale over medium-high heat. Continuously swirl until butter is nutty and fragrant, 3-4 minutes. Add gnocchi and kale and sauté to warm through and coat, about 2 minutes. Taste and add salt and pepper as needed. Divide gnocchi and kale evenly between 2 plates. Top with salmon and pour over any remaining glaze from pan.